March 31, 2002 Great swirls of yellow pine pollen float in every puddle and creek, a sure indicator of spring. The Cherokee crew is fighting off hay fever and working at a feverish pace. “Everything’s popping,” said Blake. 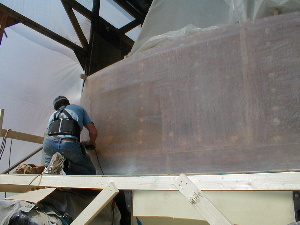 “We’re at that stage where everything seem’s to be happening at once.” But some things never change – below Bill Davis is shown board-sanding the hull. Catherine Williams, the interior decorator, has been planning interior color schemes and fabrics. 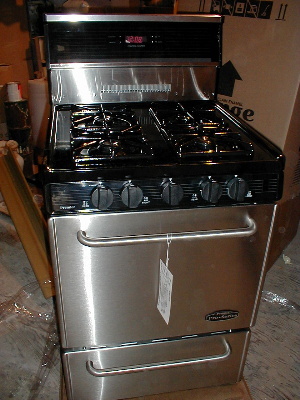 Kitchen appliances are arriving, including the microwave and stove. 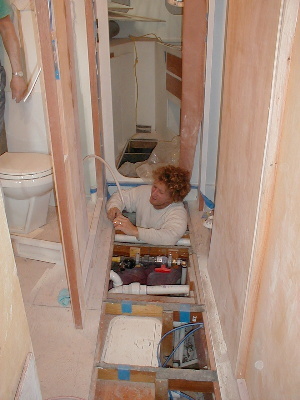 Tom Kirmeyer still finds himself in tight places, fitting the plumbing for the forward heads. Walls are going up in the forward area, adding to the “bee hive” feel of the work areas. But there is a method to the madness here! 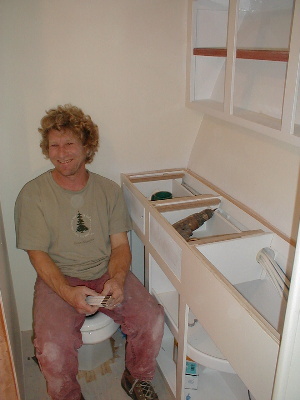 Tom Parker is working on shelving and drawers. The insides of the vanities have been top-coated. 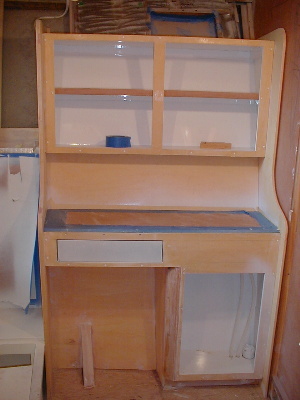 This is the last step in the process, and the priming and sanding was done before the vanities were put together. This is the most time consuming part of painting a piece of furniture like this, due to many corners and tight spaces. Painting the outside is a breeze in comparison – the outsides will be painted with the rest of the room. 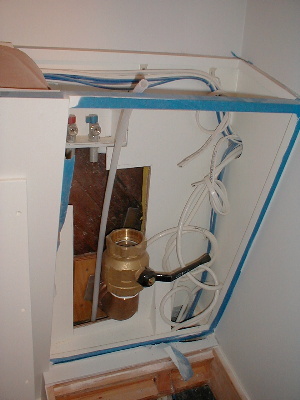 Pictured below is the through-hull and ball valve for the forward drain manifold. Everything in the forward part in the vessel that needs to discharge to the outside will discharge through this manifold. This is located right beside the washer/drier combination. Jeff Heyland is preparing to glue mahogany to the transom. This will be sanded and varnished. Then the name will be painted in place, and everyone will be awestruck at the beauty of Cherokee.